Rosy Outlook: Earthy Basics (On Sale) + FF Link-Up! Earthy Basics (On Sale) + FF Link-Up! Happy Wednesday friends! It has definitely been an interesting and busy week so far. It also has dropped about 20 degrees from last week which has been an adjustment! It's giving me all the fall feelings though so I'm not mad about it--especially since we head to the Berkshires next weekend. I also filmed a fall fashion haul this past weekend and just need to get it edited and uploaded to my YouTube channel. I'm hoping to have it up for y'all next Monday! There are definitely LOTS of goodies included. 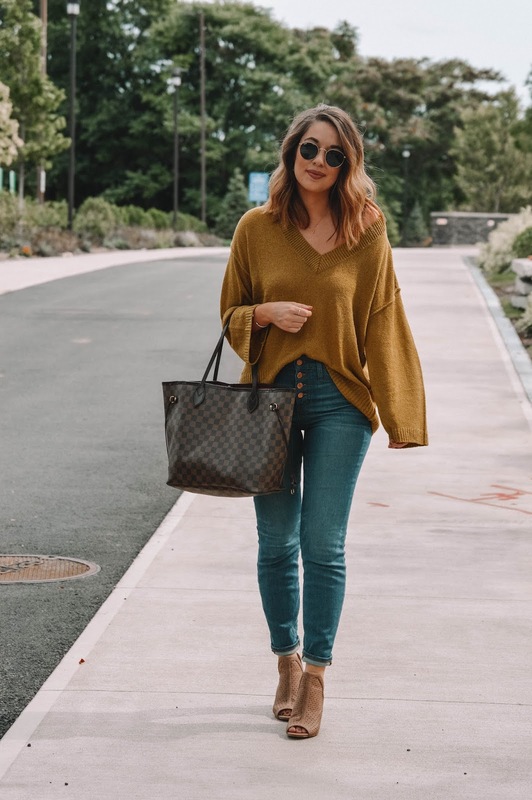 This sweater was one I included in my haul and I just can't get enough of it! It really is just such an interesting color. It's somewhere between green and gold and yellow and even though it is a very unique shade, I find it to be very flattering on my skintone. It also comes in a few other colors and is on major sale right now! I really like the color of that sweater! Fall Fabulous my friend! You've really tamed that fabulous-colored sweater! This sweater is the cutest! SO perfect for fall and I love that color on you! What a fabulous fall look! Love that sweater! Amazing outfit, I love the look! your jumper is beautiful. so sooo autumnal. I really love the color of that sweater. You're right, it's an interesting color, but the color is perfect for fall! What a great sweater! Love the color and over sized feel! I love that sweater. The color is perfect and it looks super cozy. What a cute fall look dear! Love the sweater, looks really chic and comfy on you. You look great.. I love the color of the sweater!